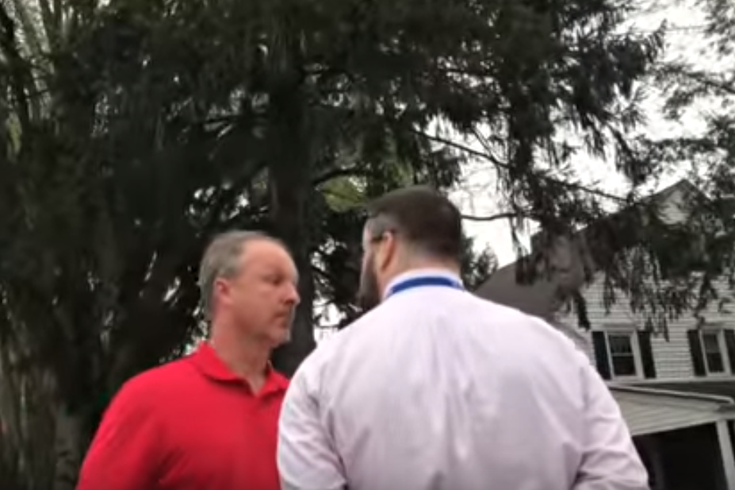 A dean at a Chester County high school was placed on administrative leave after video surfaced this week of a heated exchange with pro-life demonstrators on campus. The Downingtown Area School District confirmed Thursday an investigation is underway into the confrontation after classes ended at STEM Academy. The district became aware of the video Wednesday night and called it an "unfortunate situation." "We do not condone or support the conduct expressed in the video and are deeply disappointed that this incident occurred," the district wrote in a statement. "His conduct does not represent the values of the school district or the respect we expect our employees to show for the civil rights of others." The incident occurred Friday, April 21 on the sidewalk of the school as students were being dismissed. According to NBC10, the argument was between Mr. Zach Ruff, the school's dean of academics, and teenaged members of Project Frontlines, a Christian activist network. Ruff appeared to be directing traffic when he engaged in a shouting match with teenagers displaying pro-life signs. WARNING: The video contains explicit language. Social media users, who claimed to witness the confrontation, commented that the demonstrators were displaying graphic signs with photographs of aborted fetuses. However, the 18-minute video, which begins with Ruff approaching the teens, shows the group remained on the sidewalk and did not disrupt traffic. No footage is currently available to show what happened before Ruff confronted the group. Comments on the district's Facebook page defended Ruff's actions and questioned why the demonstrators were allowed to be so close to the school building. "This has now become a personnel matter and we must follow the policies and procedures that we have in place concerning staff issues. We truly apologize to all for the actions of this employee," the district's statement concluded. According to the school's website, Ruff has been a teacher of 10 years at the STEM Academy is currently working on his Doctoral dissertation at Drexel University.